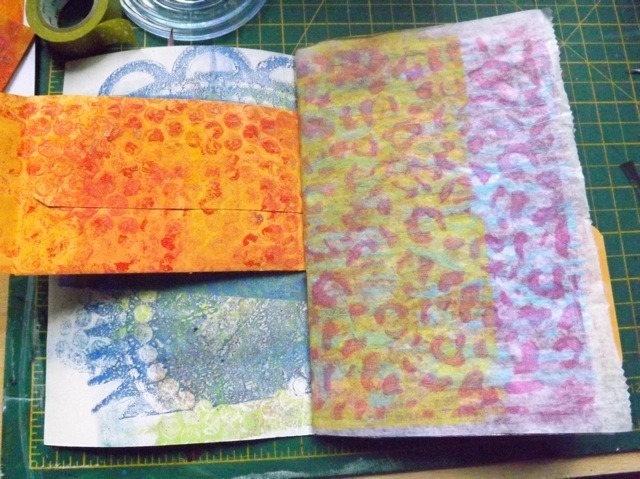 I decided to make an art journal using my Gelli prints. I wrote a long post that will appear in a new menu item up top about why I decided to do this and the format of it. I’m putting it there because it may not be of general interest but some might be curious. There is a lot to it but I’ll condense it as much as I can. 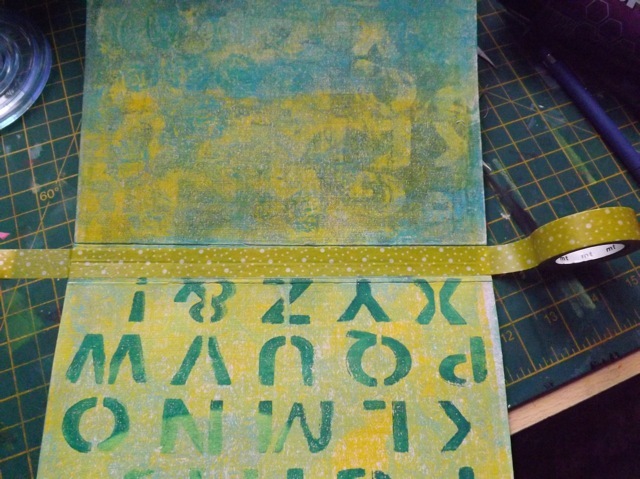 Because I am basing the pages on my 8 x 10 prints, I cut the folder down to 16.5 x 8.5 first. I scored it at 6 inches to the LEFT of the left side of the spine, then 6 inches to the RIGHT of the right side of the spine. That gave me about a 3.5 inch flap to fold over. I printed on it, inside and out. As you can see I also rounded the corners. 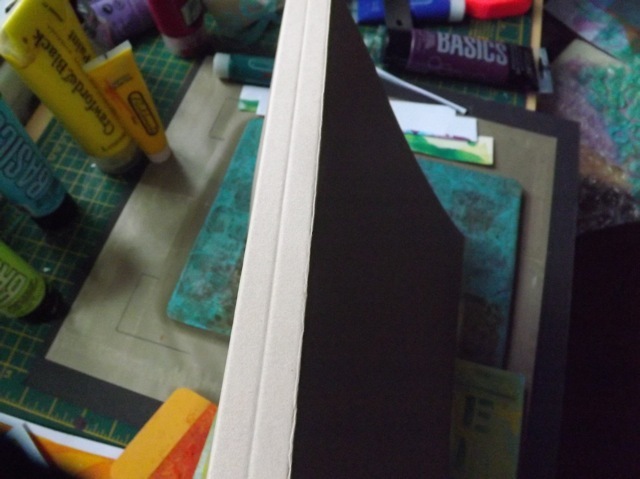 Here you can see I also reinforced the spine with a strip of Washi tape. I created two five-sheet folded signatures. 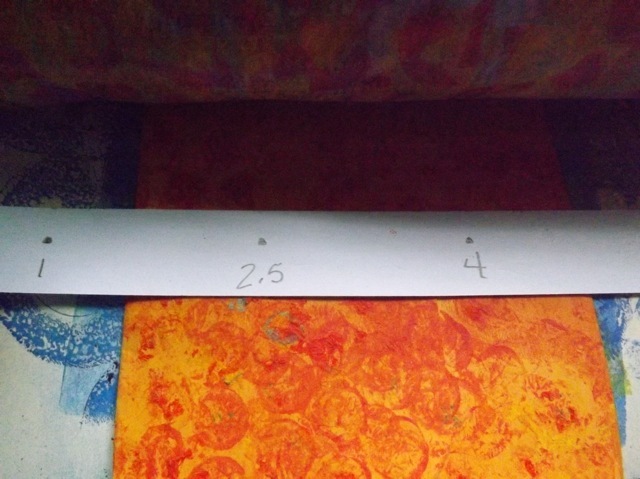 I used both reasonable weight card as well as the coin envelopes from yesterday and some sheets of Deli paper prints. My Deli paper has pinked edges and I left them, they stick out a bit at the sides for interest. 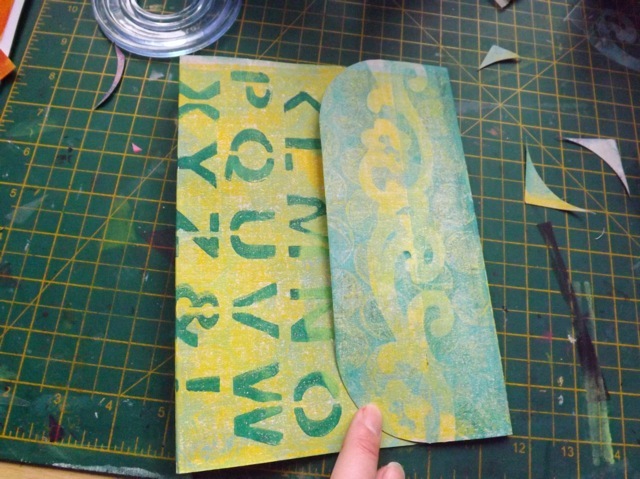 The coin envelopes are folded about an inch from the bottom edge, so the main body of the envelope matches the other page widths, and the small inch-wide bit can be stuck top and bottom to the other page to create a sort of pocket. I used a five-hole pamphlet stitch to sew the signatures into the binding. This post clearly shows how to do that. The trick is to make sure that the coin envelopes are placed carefully, so they fit with two stations of the stitching securing them. 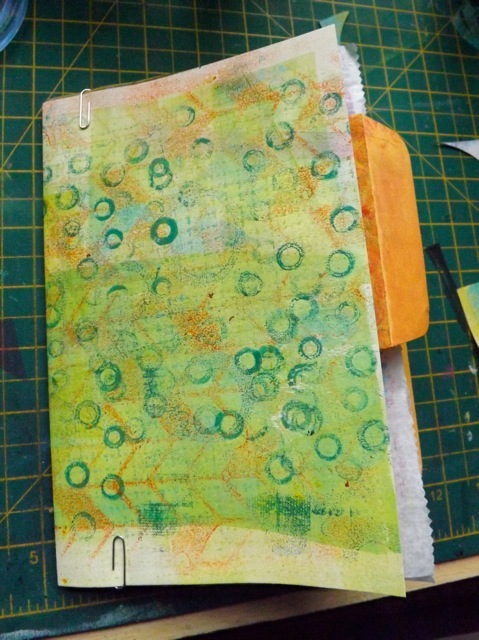 I did a bit more decorating on the cover, but am still undecided about the closure. More on that once I do decide. Since I had a LOT of prints it actually went together pretty fast. Only time will tell if I actually manage to fill it up with anything…. 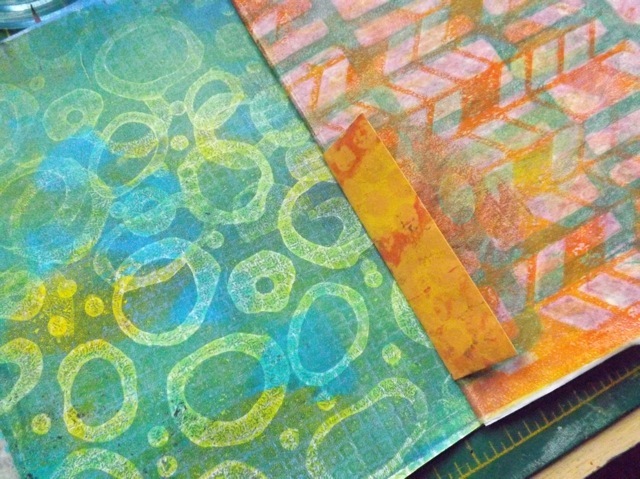 Categories: art, art journal, Gelli plate monoprints, mini-albums | Tags: art journal, art techniques, Gelli plate, how-to, mini-albums | Permalink.